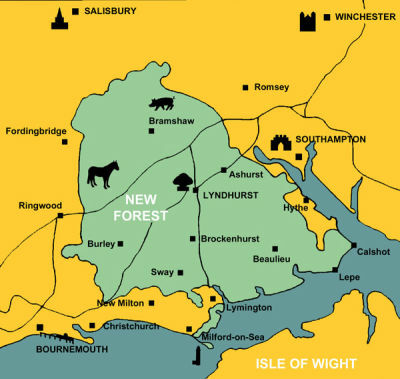 This simple map shows the main New Forest area (with the National Park in green) in relation to the surrounding cities and the Isle of Wight. It is not intended to guide travel plans, walking routes or orienteering events! You will want to buy a proper map for that. This graphic does illustrate the compact nature of the New Forest. You may come across various boundaries, each accurate in its own way. On Ordnance Survey maps you will find a New Forest district boundary as well as the New Forest National Park boundary; the latter is narrower than the former. On local maps you may find a narrower boundary still, the so-called 'Perambulation', which is the historic area within which ponies can graze.